Would you like a Blacksmith at your next event? 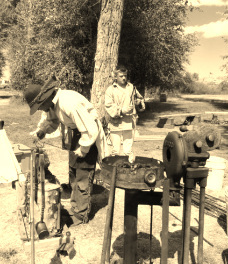 I do public demonstrations using the same methods and equipment that were used by blacksmiths well over a hundred years ago. Most of my equipment for demonstrations dates back to the early 1900's, one of my anvils was made in 1844! (I can use a gas forge if the smoke from the forge is an issue).